This local event started at the end of the Edo period. visit host homes called (o)yado which have a 42 year-old yakudoshi man. They have formal greetings with family members and helpers. and vibrates through the Kaminoma district. After 12:00a.m. on New Years Day, host families serve them (o)zouni. and rush out of the house without clothes. from the each host home to Noma Fishing Port (Noma Gyoko). Then they cleanse themselves in the sea. The act of cleansing is called misogi. After that, they return to each host house. Host families make a bonfire in the garden and welcome them. They have a bath again. They then wear loinclothes (fundoshi), headbands and sashes made of bleached cotton cloth. They also wear waraji, bleached cotton belts with bells (called fuurin) and shimenawa. Some of them have dippers(hishaku) and wooden tubs (teoke). In the Edo period they had short sword to protect themselves. Then they toured seven temples and shrines to pay their respects as they sang "Ise Ondo". They arrive at Noma Jinja (Noma Shrine) around 2:00a.m. to 3:00a.m. 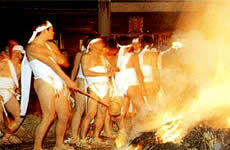 They sit around a big bonfire and sing "Ise-ondo". They have a lot of fun there. They stay at the host home. After they wake up, they have a New Year's banquet there. because they are substitutes for the men of yakudoshi in the families. A group organized with 25 year-old men (they are also on yakudoshi) sometimes participate. It is said that this custom started between 1965-1975.
two or three times (formally seven times) from 12:00a.m. on New Years Day. They have Japanese dippers (hishaku) and wooden tubs (teoke). This is a relic of the bygone age. to the temples and shrines to offer. Get off at Kaminoma Sta. on the Meitetsu Line. Get off at Mihama interchange. Take the direction to Kaminoma at the exit. Drive 3km (1.9 miles) approximatery 20 min. Meitetsu Nagoya sta. train Kaminoma Sta. Kaminoma sta. train Meitetsu Nagoya Sta.